Sometimes when I'm working in the shop I just need to wear a respirator for a short period. For instance if I just need to walk into the paint area to shoot a second coat on a small part or make a quick cut on the table saw – read below to see why that's an issue for me. Doning the powered respirator for these tasks takes much longer then the task itself. It's so much trouble that, more likely then not, I'll just try to hold my breath. This doesn't always work. So I came up with this simple solution. I took a respirator cartridge and hot glued it to the mouthpiece of a diving snorkel. Now can pop this in my mouth and have both hands free for a quick operation, I just breath in through the cartridge and out through my nose. Sometime during the work on my school bus to RV conversion I developed an allergy to pine sawdust. At first I didn't realize what my trouble was. It started with a mild headache that just wouldn't go away. After about four days I grew concerned enough to go to the doctor. My regular physician was not available so I saw another guy who gave me a prescription for some barbiturate based headache medication. I drove home, stopped to pickup the prescription, and vomited in the parking lot of the CVS. I opened the bag to take on of the pills and noticed that in addition to the barbiturate they contained aspirin, my stomach does not tolerate aspirin well. Screw it, I'm off to the ER I thought. At the ER I explained my problem and got to see a doc after about 20 minutes. Since I had no history of headaches of this magnitude (just an occasional migraine, once or twice a year) they felt they had to rule out things like meningitis, tumors, brain spiders, and other headache inducing things before they could medicate me.I really wanted very badly to be medicated at that point. Unfortunately, the first test on the list was a CAT scan and the machine was booked for a couple of hours. They found me a quiet room in which to suffer. About an eternity and a half later they brought me in and did the CAT scan. Another half hour or so for them to look at the results which revealed nothing but a fine healthy brain. Turn it to 11 . . .
Spinal taps are supposed to hurt a lot, but my pain receptors were so swamped that I felt only the tiniest prick, and that took a bit of my attention off my head so it actually felt good. I think that the doctors and nurses had come to understand how much pain I was in because a pair waited with IV bags and a syringe and the moment the spinal tap was done they started me on something called Torridol and gave me a shot of some morphine derivative. Within 10 minutes I fell blissfully asleep. An hour later the doc came in to see how I was doing, "much better thanks." The tests had found nothing, "probably just a tension headache" he said. "You mean I did this to myself?" I said incredulously. He only shrugged. I left the hospital with prescriptions for more barbiturates (this time with Tylenol) and Vicodin. For the next few days I alternated the barbs and Vicodin, slowly tapering off both until the headache stayed gone about 5 days later. I took it easy for a week or two and then started to get back into things. I started working on the bus project again and over the course of the next few months got several headaches. But since I had medication and took it the moment I felt one coming on it never got as bad as the first one. The curious thing was they would always come at night. I would wake up about 2:00 AM with a terrible headache and have to go get some meds. At one point I though maybe I was suffering from sleep apnea. Another curious thing was noticed by my wife, it was alway Saturday night when I awoke with a headache. Then one Saturday I woke at the usual 2:00 AM with what was probably the fifth or sixth head-ache, went downstairs to get my meds, and went back to sleep. But this time my subconscious must have stayed up because I awoke that morning KNOWING that it was the pine sawdust that was causing my trouble. To test my theory I got out the powered respirator the I use for painting and wore it the whole time I used the table saw and sander – no headache that weekend. 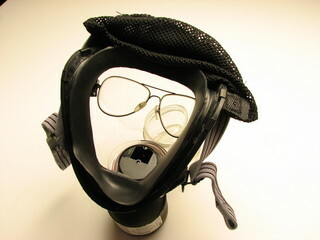 I continued to use the respirator and was headache free for a couple of months. 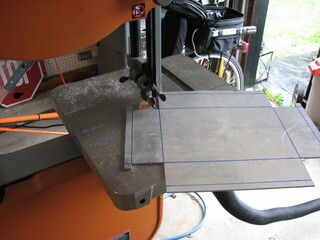 Then I got lazy and did a few quick cuts without the respirator, that night I woke up with the first headache in months. Confirmed. I can't use a conventional respirator because I sport a beard and a normal respirator or nuisance dust mask will not properly seal to my face. For painting I've always used a Pro-Air Supplied Air Respirator that deliveres fresh air to me via it's 50 foot hose. However, walking around the wood shop dragging a 50 foot hose gets old real quick. The system described below is for "nuisance" dust only, it will not protect you from anything truly dangerous. The automotive filter used is not "man rated." 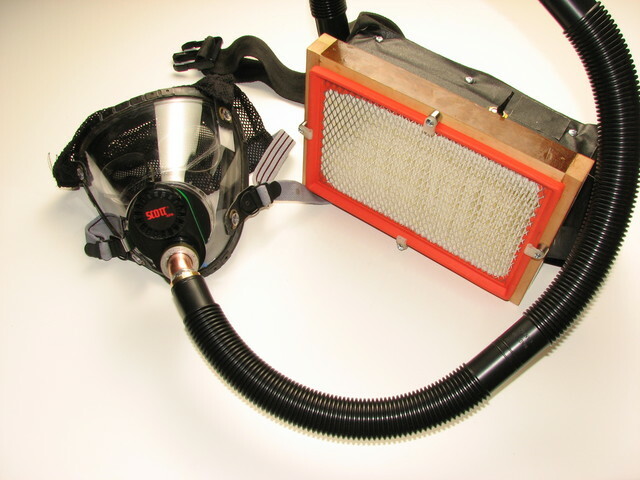 The solution was a powered respirator with a blower and filter I could wear, perhaps around my waist. An additional difficulty was my glasses. When I wore the Pro-Air respirator I found it very difficult to get a pair of goggles to go over my glasses and fit with the respirator on my face. So I went looking on eBay and found this "military style tear gas mask" for about $40. It's very well made with a hard coated face, anti-fog membrane, and comfort mesh headpiece. I'm told they sell new for over $200. 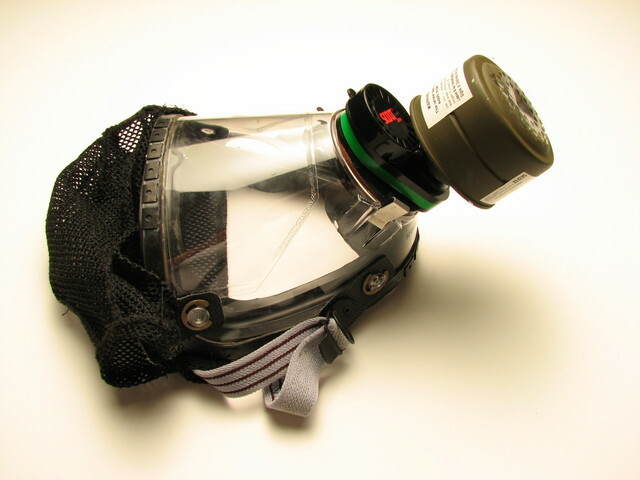 the seller listed the mask as used and it had the number "019" written on it but the canister seal was in place and there was no evidence it had been worn. The face seal worked very well too, in fact I think I could have used the mask as is without modification if I did not wear glasses, the temples of my glasses would not fit past the seals. 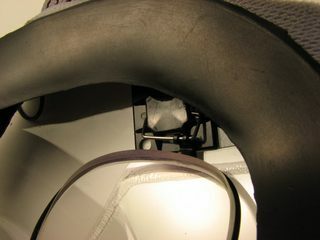 I located an old pair of my prescription glasses and mounted them inside the mask with a peel-and-stick cable hold down and a clip I formed from piano wire. The glasses are allowed to slide up and down on the piano wire so they rest comfortably on my nose. The next step was to fabricate the blower case. 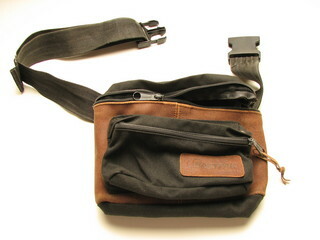 I cannibalized an old fanny pack with a broken zipper and cut a box form on the bandsaw from an old street sign that I pulled from the metal recycling dumpster at our town dump. It was one of those "Slow Children" signs we used to laugh at when we were kids. I folded the box on a sheet metal brake but goofed up on one side so had to pop-rivet on a piece of aluminum angle. 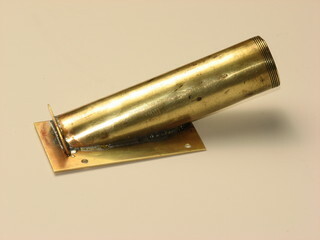 Then I made an outlet for the blower out of some pieces of scrap brass, this is a 1" sink drain pipe. 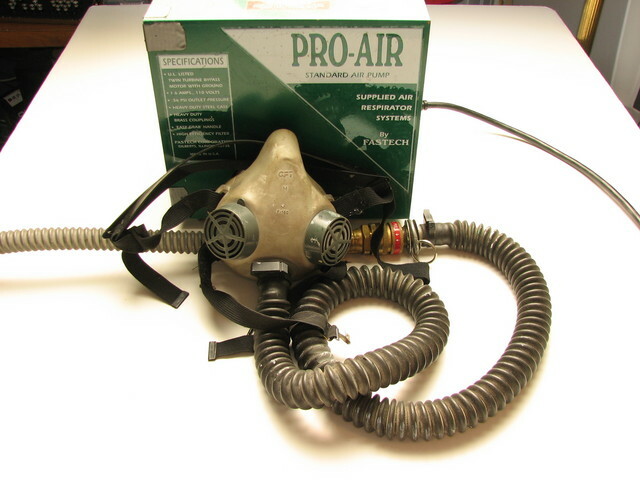 Initially, I planned to attach a couple of respirator cartridges so I could use this rig while painting as well as for wood working but the cartridges proved too restrictive and the blower blades stalled to the point where they moved no air through the mask. 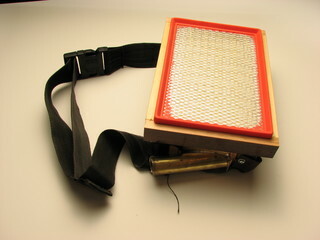 The blower is a 12 volt 13 watt squirrel cage blower from a DPT SCSI hard disk array. I thought about options for a while and hit upon an automotive air filter as a high-efficiency high-flow filter solution. 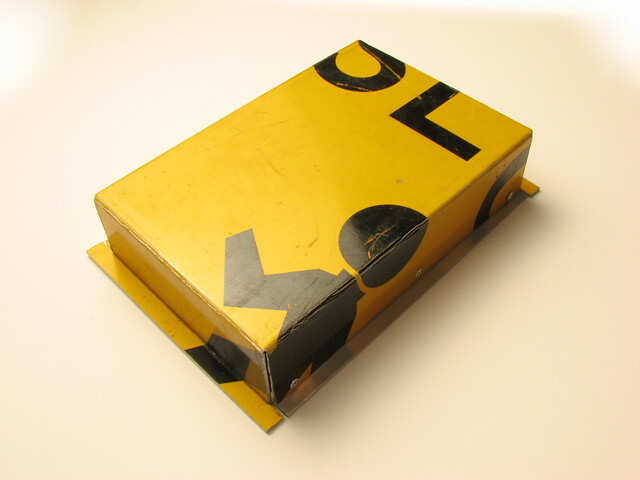 I measured my box and went off to the auto parts store. They saw me coming and hid. This often happens as the first thing they'll ask me is what kind of car I need a part for and I'm almost never buying something to use for it's intended purpose. This time I got lucky and only had to open 5 boxes before I found one that matched the dimensions of my blower box. 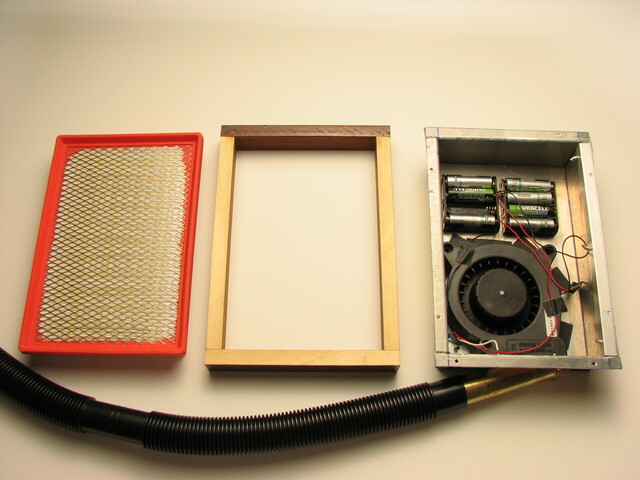 I made a wooden frame to hold the filter as it was too deep to fit in the box and the used GE Silicone II sealant to seal the frame, box and outlet pipe. Next I needed to connect the mask to the blower. 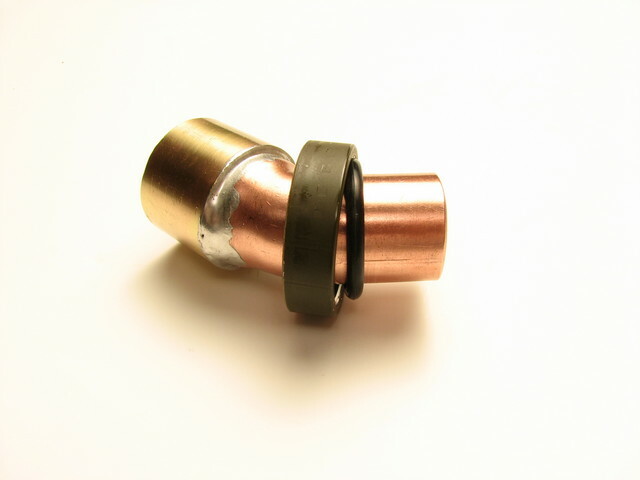 I found that a 3/4" 45 degree copper street elbow was just the thing. 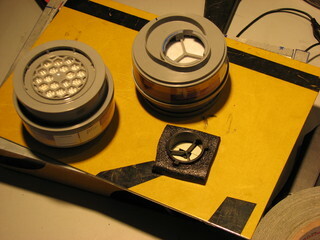 I needed something to hold it to the mask so I cut apart the tear gas canister and removed the threaded ring. 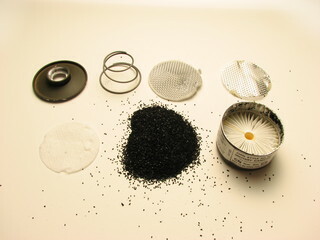 Below right is a picture of what you find in a tear gas canister; a particle filter, some retaining screens, and a charge of activated charcoal. Here's my mask fitting with an "O" ring to seal to the mask and a brass bushing to fit to the hose. The hose I used is 1" bilge hose I got at True Value hardware for $1.79 a foot. 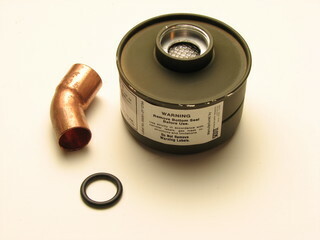 Home Depot also sells an accessory vacuum cleaner hose that would have been more flexible but also much more expensive. If you actually did want to have a chemical canister setup for painting (though, actually, the auto filter likely being HEPA should be more than enough) you can actually buy true 40mm gas mask hoses and a blower (the military uses or used the c420, a couple of which are on eBay), which will run you a total of around $110. Your solution to your allergy is absolutey brilliant. I like the historical narrative and build description given prior to the video. Very informative. You my friend, are a genius. Not only did you diagnose accurately the cause of your own health problem, but you built a very professional breathing unit to enable you to continue working in a hostile environment. I am very impressed with your application of logic and sound reasoning. I have a similar, but less severe problem with cedar dust. 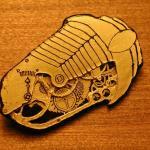 I will start collecting bits and pieces to build my own unit. Thank you Jake, for making the effort and taking the time to share your journey. Glad you found something that worked. 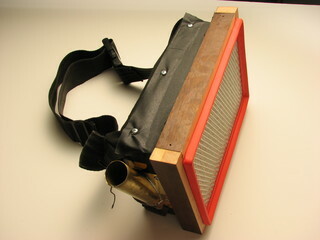 There’s a product called the res-po-ra-tor that’s a snorkel type dust filter. They work well for us bearded ones.